Santa Fe ~ "The City of Holy Faith"
Santa Fe is the oldest capital city in the US. Originally, it was known by the indigenous as the "Dancing Ground of the Sun." 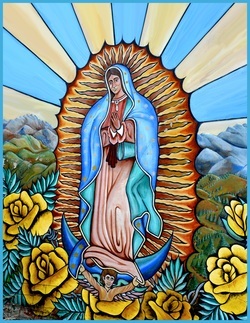 From the Spanish, its name translated means "The City of Holy Faith." 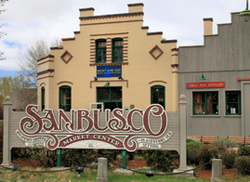 Historic neighborhoods of 400-year-old adobe homes and churches made of earth, water, and straw stand as testament to centuries of perseverance and resiliency in a place where deep cultural and spiritual roots mixed with a timeless commitment to family, community, and nature still prevail. Nestled at the base of what the Spanish referred to as the Sangre de Cristo Mountains, or "Blood of Christ," Santa Fe is the capital city of the State of New Mexico, known as "The Land of Enchantment." 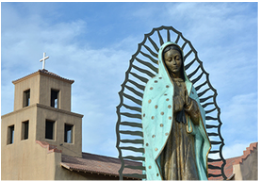 To learn more about Our Lady of Guadalupe's historic and influential presence here, browse the links below.